Very nice lamps. After searching high and low for the perfect lamp set, I finally decided on this pair and it was worth the search! Safavieh Lighting Makenna Table Lamp 25 Inch - White / Blue - 16" x 11" x 25"
Safavieh Lighting 25" inch Orianna Table Lamp -Blue / White - 15" x 15" x 25"
Safavieh Lighting Alisha Table Lamp 21.5 Inch - Black / White - 13" x 13" x 21.5"
Safavieh Lighting 32-inch Aileen Table Lamp - Blue / Gold - 18" x 18" x 32"
The soft curves of this contemporary table lamp makes it a celebration of form. Designed with a chic white and blue pattern, its soothing tones and gold accents create a grand artistic statement. Ideal for framing a sofa in the living room or a bed in the bedroom. Dimensions 11.0 In. X 16.0 In. X 25.0 In. Perfect size. not too big not too small. heavy, looks expensive but its not. I really am SO pleased with this lamp. Shade is pure white and white in lamp is pure white. I agree with other reviewer about being surprised by shape. It is not a globe. It is a flattened oval. It is however still a very beautiful lamp. Very “expensive” looking—the gold detail is gorgeous. Packaged carefully. The shade is true white. The blue is navy. Modern and classic all at once. Love the shape and the pattern of this lamp! Love the color this lamp adds to my guest room. Was a little surprised that the shape wasn’t round but more a flattened oval. All in all am happy with the selection. It's the right size and look. 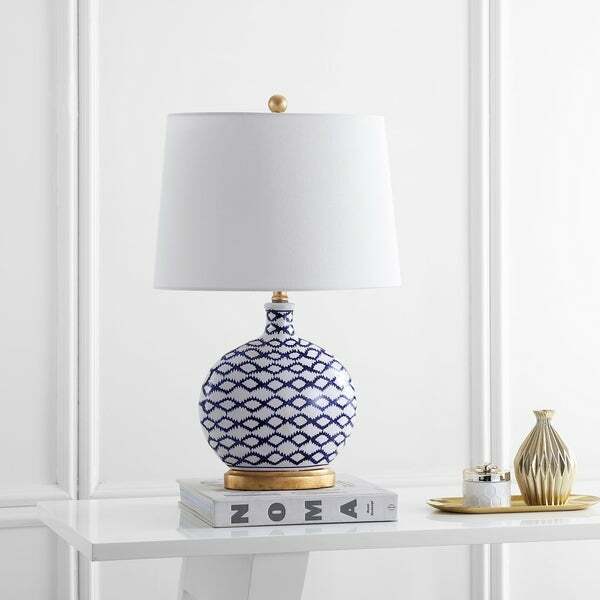 Safavieh Lighting Kyra Table Lamp 21 Inch - Blue / White - 10" x 10" x 21"
Safavieh Lighting 31-inch Aviana Table Lamp - Gold / Blue - 17" x 17" x 31"